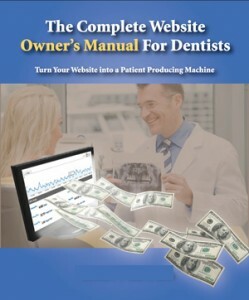 The 2nd Edition of my book, “The Complete Website Owner’s Manual for Dentists,” is ready to go! I decided to make it a downloadable product this time around. The original paper version was expensive to print, due to full-color illustrations printed on glossy paper. It was also expensive to ship, and there were more problems with missing shipments than I cared or had time to deal with. A digital version also provides instant gratification. I spent a lot of time re-writing and editing to update the first edition, adding 30 pages to the original. While a lot of the principles of website marketing remain constant, there have been many changes, as well. The original printed (on glossy paper) 1st Edition sold for $347. The digital 2nd Edition is priced at $148. For a limited time, you can save an additional $50 by using the coupon code, “dental warrior” (without the quotes) in the check-out screen! Remember, this is an instantly downloadable product. No waiting! The information in this book can save you THOUSANDS in misspent website fees and MAKE you thousands with new patients. Visit my website (Rev Up My Marketing) to see a long list of testimonials and learn more about what you will get from this book. Or get it right now by clicking the button below. This entry was posted in Dental Warrior Announcements, Must Read Books!, Websites and tagged website marketing book, Website Owner's Manual. Bookmark the permalink. 5 Responses to The Website Owner’s Manual – 2nd Edition! Been following you lately and waiting for second edition. thanks. Looking forward to it. Thanks, Chin! I hope it helps! so far it’s worth every penny…and i am only 50pgs in! Need to find time to read version 2. I purchased version 1 and it helped me out so much. I bought a practice from a retiring 72 year old dentist. Getting new patients was a struggle as I was not on any insurance lists. Ive worked like crazy online and Mike’s book helped me. I wrote all the content and then gave it to my webmaster. Buying the first version helped me understand what my website was really for…..to get patients. I’m killing it online and dominate long tail searches.